I choose plants for the front landscape more carefully than for the rest of my gardens and landscape. That is not to say that they are prefect and trouble free, or that someday they won’t be booted for something “better”. But I don’t like to experiment too much in front, I save potential failures for less visible areas. Large permanent trees are just that, permanent. I like to get it right the first time. And foundation shrubs are a lot of work to move or replace, so ditto. This is a Variegated Maple, Acer platanoides ‘Variegatum’.. As noted in the previous page I chose it because it has variegated leaves with an open form, so the crown does not get terribly dense. The result is a more airy looking shade tree with light and bright foliage. However, these tend to sprout reverted branches. These sprouts produce solid green foliage and grow aggressively. I sprouts are left unpruned the entire tree will revert to nonvariegated foliage. So, I have to prune reverted sprouts out as soon as I find them. That explains why the crown is a bit lopsided. This tree is also growing extremely slow, slower than should be expected. So far I have decided to put up with the problems, we’ll see. This is a fairly new tree, Syringa recticulate ‘Japanese Lilac Tree’. I selected it to replace a tree that went down in a storm. It has a lovely dense crown and is covered with wonderful lilac blooms in late spring, later than a lilac shrub. The blooms are ivory and do not have the sweet scent of lilacs. It took a few years to establish and is now growing fairly quickly and blooming quite nicely. Like a lilac shrub, it does produce an occasional sucker from the base of the trunk, not a problem to just prune it off. So far I am quite pleased. This was one of the first trees I planted, a slow growing Pin Oak. It casts a nice shade across the front of the house late in the day. I love the pyramid shape for the front of the house, and for this narrow side it does not seem so overwhelming as a big rounded crown would be. It maintains shape beautifully, I just prune lower branches if the hang low enough to interfere with the garden path or mowing. 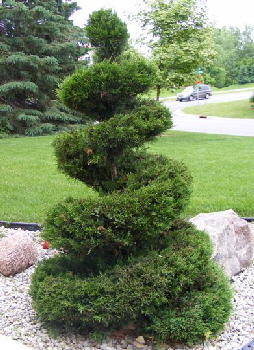 This was a little birthday gift from my mother several years ago, Juniperus chinensis ‘Monlep’ Mint Julep Juniper topiary. Let me start by saying you only want one topiary, unless you have a lot of time on your hands. The first few years was easy as it was growing very slowly. I could snip a little here and there with a grass shear. I am using a power trimmer now, perhaps not the best tool for the job, I really don’t know. It is increasingly difficult to maintain a good shape. And to make matters worse, a few years ago after several soaking rains it started to lean and I was unable to correct it. So now I am trying to prune to compensate. I do love the topiary though and am willing to maintain just one as best I can. It has been a very hardy and trouble free tree. One of my many arborvitae, Thuja occidentalis ‘Holmstrup’. We all get a little bored with arborvitae up here, but they are so hardy, reliable, don’t winter burn normally, and prune wonderfully if you keep up with them. Of course you can’t buy a giant arborvitae and keep it pruned to a small foundation size. But if you start with the right one maintenance is pretty easy. ‘Holmstrup’ is a natural pyramid form and does not get very large, perfect for flanking the garage doors with just enough height to reach the light fixtures. Although mine are getting a bit “fat”, I think the pruning got away from me for a couple of consecutive years. Once that happens it is difficult to prune as much as you might like without exposing the innards. Now I have to make sure I prune a couple of times each season to keep it from overgrowing its’ space. All the same advantages in the north as ‘Holmstrup’ above, this Glove Arborvitae, Thuja occidentalis ‘Woodwardii’ is perfect for foundation planting. If you have adequate space, they don’t need pruning at all if you prefer a less formal look. They will maintain the globular shape, just without the “perfectly sheared” look. Just remember that the mature size on the tag is for only 10 years growth. Your arborvitae will live a LOT longer than that, and it will keep getting larger. ‘Johnson Blue’ Cranesbill are all over my property. I bought three several years ago and now I have, well let’s see, 10 or 12, plus the ones I just pulled up as seedlings. They love to give you a few volunteers now and then, but not aggressively (also handy when your husband pulls the young spring plants because he thought they were weeds.). I think some of the new Cranesbill do not get so overgrown and fall right over, but I absolutely love the true blue. So every once in a while a find a new place to plant them. I do like how these soften the look of sheared globes. I think this is my all time favorite plant that I took a chance on. Red Ribbons groundcover rose, originally from Jackson Perkins, but I believe their patent is up now and you can get them from other nurseries. They are not, in theory, hardy enough for zone 4. But I think I have had these growing here for maybe 15 years trouble free with no special care whatsoever. They are absolutely covered with vivid true red roses all season. LOVE these, they ad so much to the front landscape and easy, easy, easy. And yet another arborvitae, Thuja ‘Teddy’. I like a lot of things about these little guys. First, they are little, and stay pretty little. I have three of them in front of the entry along with the Red Ribbons. BUT, they winter burn pretty bad. When they were young I covered them with burlap. As they matured I thought they could handle it better, no. They burn pretty bad other than in mild winters which don’t come along too often. If the burn is mild fresh growth will cover the problem by mid season. But when its bad, its really bad. This year is awful. And they don’t prune well. The more dead foliage I cut out, the more it dies back. Not sure about their future here. I love my window boxes! Many years I just put in Red Geraniums and white or blue petunias. Here I also have lobelia, but they don’t take the sun, heat and lack of water well. Under the eaves I have to stick with drought tolerant annuals and still have to water a lot. I experiment with plant combinations once in a while, but spring is always so busy I often just grab the old reliables and get them in. Lobelia and sweet potato vine work well in here too. And the final accent in the front landscape, the front entry urns. I need a photo in late season when the petunias and sweet potato vines are spilling out all over! Just like my window boxes, I don’t change things up much. I like these annual accents to do great, not just ok, so I stick with my old reliables. If it ain’t broke I don’t fix it. Major experimentation takes place everywhere but the front landscape.